Personalization is the process of incorporating known information into the marketing message being conveyed. Many studies have shown increased response rates when personalization is used. The simplest example is incorporating the individuals name into the copy. More complex examples would be to use relevant graphics or pictures that should be of interest, for example using a graduating class picture of the year which alumni are being invited for a reunion. Businesses can provide offers to current customers based on previous purchases, such as service options or peripheral equipment and supplies. 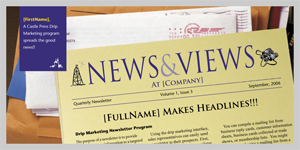 The development of a direct marketing piece is a collaborate effort. The marketing team on the client side works with Castle Press team of account representative, design staff, and software developers. Client goals and objectives are established and a plan is developed that will accomplish the desired outcome. The plan includes a Creative Brief, Variable Data Specifications and a Data Map for use of existing information. For Castle Press clients and registered users we offer these planning tools to aid you in your planning process. How can existing digital information be used? How do I prepare a database file? What information is required to prepare a creative brief? Users can determine Return on Investment (ROI) through the use of Personalized QR codes. There is usually an increased response rate when using these codes due to the ease of responding. The easiest way to provide your data is in an Excel database or spreadsheet. Each bit of information is in a separate field which will allow different bits of information to be combined. It is important that preferred field names are used for clarity. A Creative Brief establishes goals and objectives for your marketing efforts. It helps bring clarity to all participates and ends ambiguity. The preparation of a Creative Brief always saves time, money and lowers everyone’s stress level.